Agama A8 « Big Squid RC – RC Car and Truck News, Reviews, Videos, and More! You are browsing the "Agama A8" tag archive. 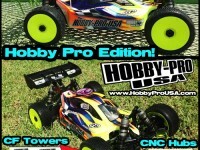 For those looking to get their hands on a Agama A8 Evo, VP-Pro USA is now the official distributor for the 1/8th scale buggy here in the US. VP-Pro USA is becoming quite the online retailer lately, they have a ton of products, so go check it out.